- Ask women questions and find out about them rather than talk about yourself. or try tell her how you are going to change her life the first time you meet her. Ask her questions, don't come on too strong or too touchy. Avoid the disappearing act if you have been dating for a while. 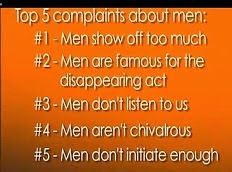 - Listen to them when they talk (a huge complaint from women). Focus on the woman across from you and really listen to what they say. - Dating a gentleman MATTERS to women. Treat them like women because that's what they want, as well as your equals! So be chivalrous, guys. eg. pick up the tabs, open the door, etc. - Take the initiative with women if the chemistry is there and she is interested. Has she invited you into her apartment or let the date go far into the night? In various ways eg. plan the date, make it a fantastic one, etc.